Drew and Terry posing at the trail head, beginning this six-mile roundtrip hike. We spent the night camping at the Buckhorn campground. 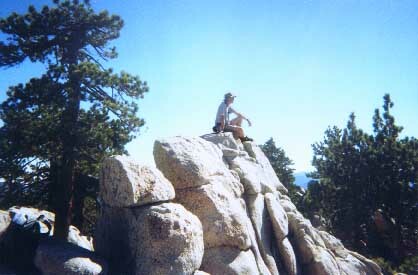 Dan looking south as he sits on the summit of Mt. Waterman. 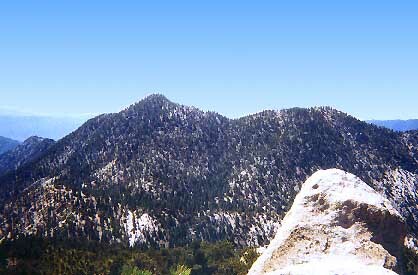 Waterman is broadtopped with several summits. Lots of trees obscuring the views. It took us 1.5 hours to cover the three miles, 1,300-foot elevation gain. Looking west from the summit. 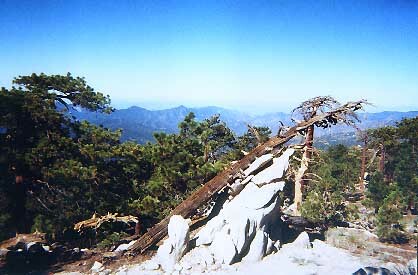 The pointed peak in the middle on the horizon is Strawberry Peak (6164'). The peak to its left is Mount Lawor (5957'). Twin Peaks (7761' left, 7569' right). I took this photo looking south from a granite outcropping which is a few minutes walk below and south of Mt. 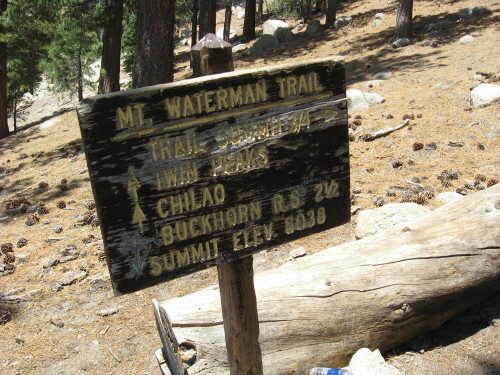 Waterman summit. Takes a little class 3 rock climbing to scramble round these rocks, but it is well worth it. The views are much better than on Waterman. This page was last updated August 27, 2014.